GitHub today announced the release of Atom 1.18, the new stable version of its open-source and cross-platform hackable text editor, introducing Git and GitHub integration for the first time. As teased last month when Atom 1.18 was promoted to the Beta channel, along with the stable Atom 1.17 release, the biggest new feature is the integration of both Git and GitHub straight into the heart of Atom. “We’re thrilled to be shipping rich integration with Git and GitHub in Atom 1.18! 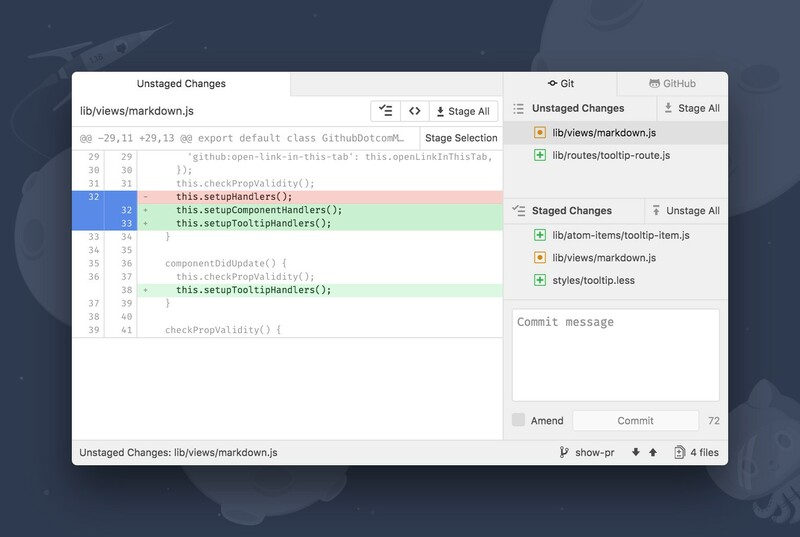 This is merely the first release but we’re excited about what it already brings to the editor,” says Ian Olsen, Atom and Electron developer at GitHub. But Atom 1.18 also improves launching from WSL (Windows Subsystem for Linux), adds a new option to allow users to restore the previous session each time they open the app, and a new setting for displaying context in find-and-replace. The suggestions in autocomplete-html and the tokenizing performance via oniguruma caching were also improved in this release, which is accompanied by Atom 1.19 Beta that implements the underlying text buffer in native C++. This implementation promises to enable asynchronous file saves in Atom, which will never block the user interface, and also reducing the memory usage when dealing with large files. Atom 1.19 will be updated to Electron 1.6.9 and should include a complete rewrite of the text editor’s rendering layer. You can download both Atom 1.18 and Atom 1.19 Beta for GNU/Linux, macOS, and Microsoft Windows right now from website.